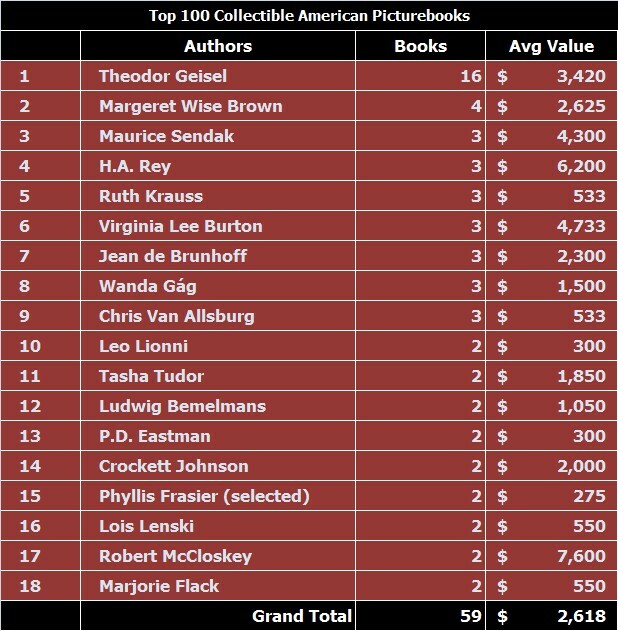 The previous article focused on the relative scarcity of the Top 100 Collectible American Picturebooks. 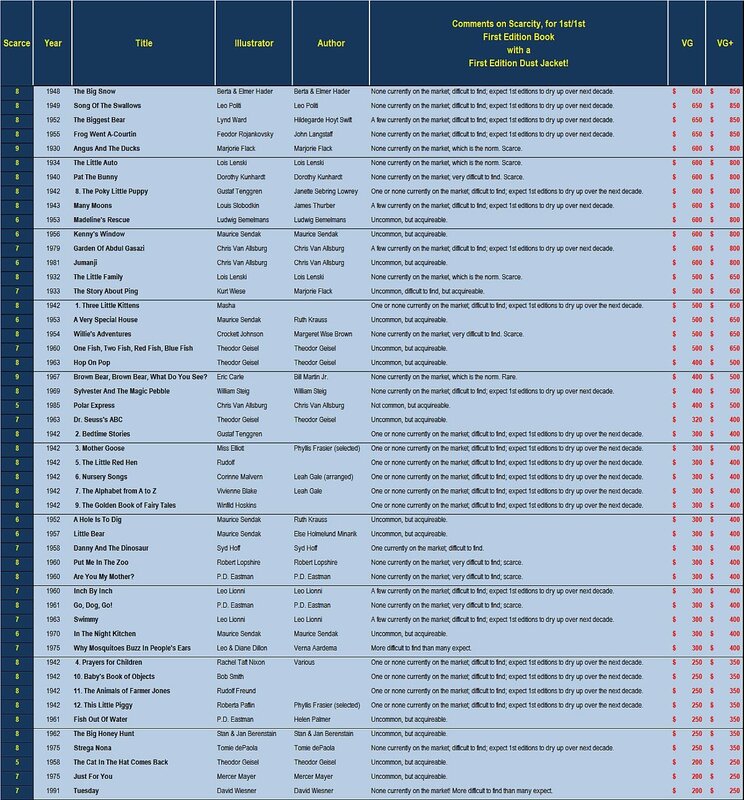 Today’s column provides various views of the Top 100 sorted and grouped along the value of the books. 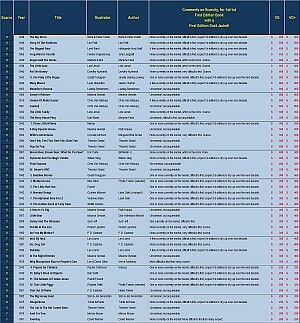 The following lists the Top 100 books by value, and includes the single line summary of the book’s scarcity, along with the estimated market price. The market price is for the first edition book with the corresponding first edition dust jacket, both in Very Good or VG+ condition. 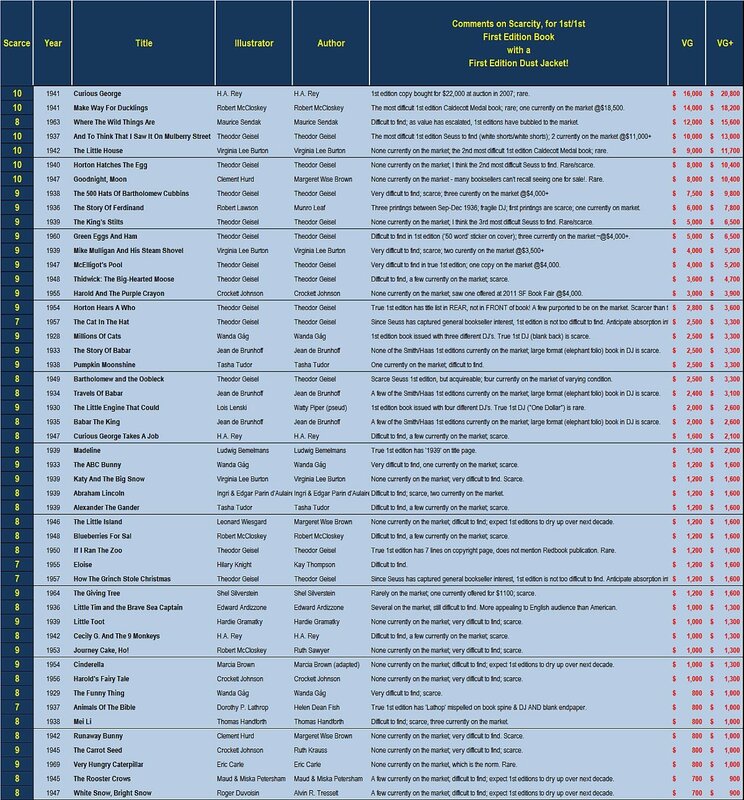 The most valuable book in the list is the first edition Curious George, with an estimated market value ranging from $16,000-$21,000, depending upon the book’s condition. The last recorded sale was in 2007, when a Near Fine first edition sold for $22,000 at a PBA Galleries auction. Even with the escalation in value of collectible picturebooks over the past couple of years, with only a sample size of one sale, I chose a conservative valuation. Another recorded sale would help to cement the market value. Twenty-one of the first edition children’s picturebooks have an estimated market value of at least $2500 in Very Good condition. 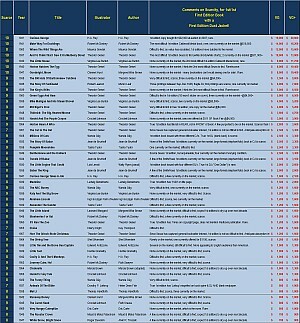 Remarkably, as the following table shows, ten of the twenty-one books are written and illustrated by Dr. Seuss! The most valuable Dr. Seuss book is the first edition of his first childen’s book, And To Think I Saw It On Mulberry Street, valued at $10,000 for a Very Good book in a Very Good dust jacket, followed closely by Horton Hatches The Egg at $8,000. Both books are scarce in first edition. It is difficult to assess the value of Goodnight, Moon, the classic tale written by Margaret Wise Brown and illustrated by her often collaborator Clement Hurd, the 7th most valuable American picturebook. There are no recorded sales of the first edition, and few comparable books to use as a measuring stick. If a first edition Goodnight, Moon came to market and was offered by a reputable house, at a well publicized auction, the gavel could range from $4,000 up to as high as $25,000. It’s just difficult to estimate the intensity and breadth of the demand. Although not as scarce as other collectible picturebooks in it’s price range, Where The Wild Things Are has a high market value due to the strong demand for the first edition. 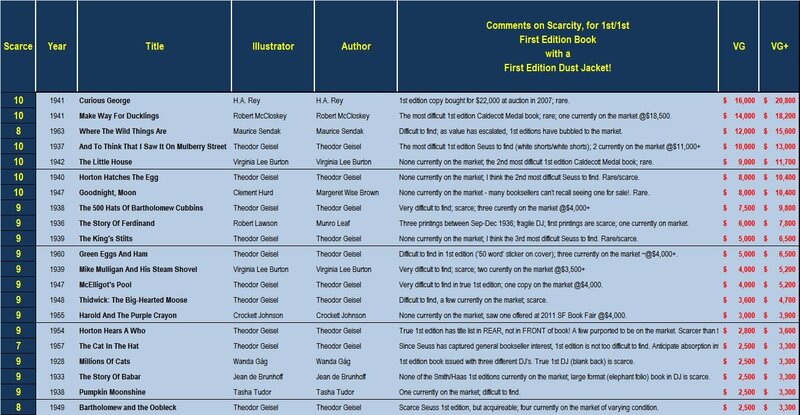 Most booksellers, not just children’s book specialists, know of the value of Maurice Sendak’s Caldecott Medal winner therefore have been on the lookout for first edition for a number of years. Because of this attention, more of the first editions have surfaced then many of its lesser known peers. The same can be said for the supply of first editions of The Cat In The Hat currently on the market. For both books, over the next decade, I think the supply of first editions will be absorbed by the collector and institutional buyers, since the two books have such high collectibility. Virginia Lee Burton’s Caldecott Medal The Little House will likely increase in value relative to the peer group. I tend to be conservative when assessing the value of picturebooks. A couple of years ago, a first edition copy of Where The Wild Things Are and The Little House, in similar condition, were offered at the same PBA Galleries auction where the first edition Curious George sold for $22,000. The Little House sold for $9,000 while the Where The Wild Things Are sold for $7,000. Since then, the selling price of Where The Wild Things Are has gradually increased. 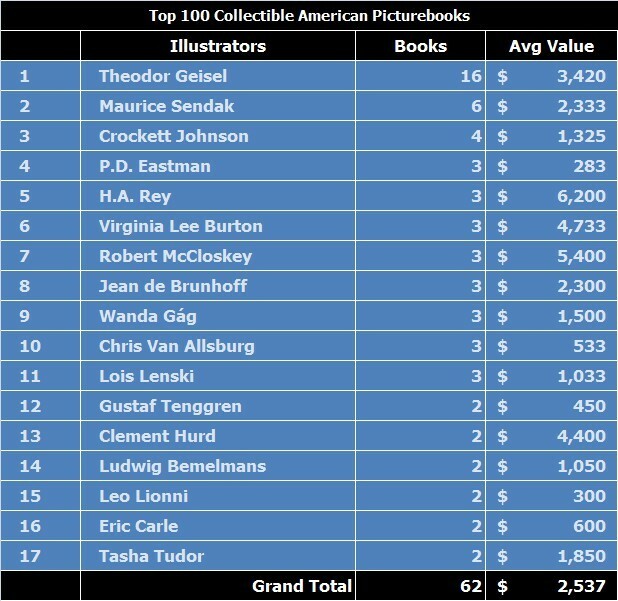 The Top 100 Collectible American Picturebooks was put together following some partially logical steps where books were selected in groups. Seven picturebooks were given a scarcity rating of ’10’, meaning the first edition book is not normally on the market and only comes up for sale every couple of years. Each of these is very, very difficult to acquire. Only two of the six picturebooks are currently on the market. 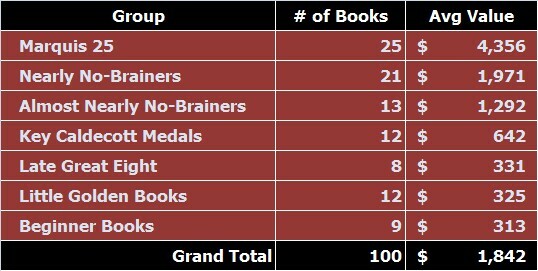 Good luck acquiring these for your children’s book collection.The twenty-one Nearly No-Brainers average $1,971 per book, while the thirteen Almost Nearly No-Brainers average $1,292 per book, as per the table, below. To reiterate, the values are for the first edition book in a first edition dust jacket in very good condition. Sixteen first edition books illustrated by Dr. Seuss made the list of Top 100 Collectible American Picturebooks, with an average value of $3,420. Six Maurice Sendak illustrated books made the list, with an average value of $2,333. While Dr. Seuss had the most books on the list, his books did not have the highest average value. That honor would go to H.A. Rey, the illustrator for the Curious George books, with an average value of $6,200. Robert McCloskey’s three books averaged $5,400. Recounting from the list of illustrators, above, sixteen first edition books authored by Dr. Seuss made the list of Top 100 Collectible American Picturebooks, with an average value of $3,420. Four books authored by Margaret Wise Brown made the list, with an average value of $2,625. 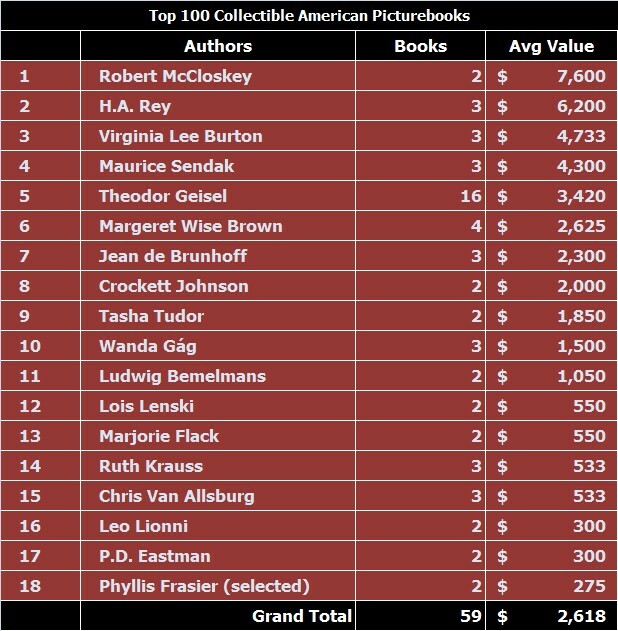 Ruth Krauss, the wife of Crockett Johnson, is the other notable ‘author-only’ on the list of Top 100 Collectible American Pictureboos – most of the authors on the list were also the illustrator for the book. While Dr. Seuss had the most books on the list, his books did not have the highest average value. That honor would go to Robert McCloskey, the author of Make Way For Ducklings and Blueberries For Sal, with an average value of $7,300. McCloskey illustrated a third book on the list, Journey Cake, Ho!, which was authored by Newbery Medalist Ruth Sawyer. 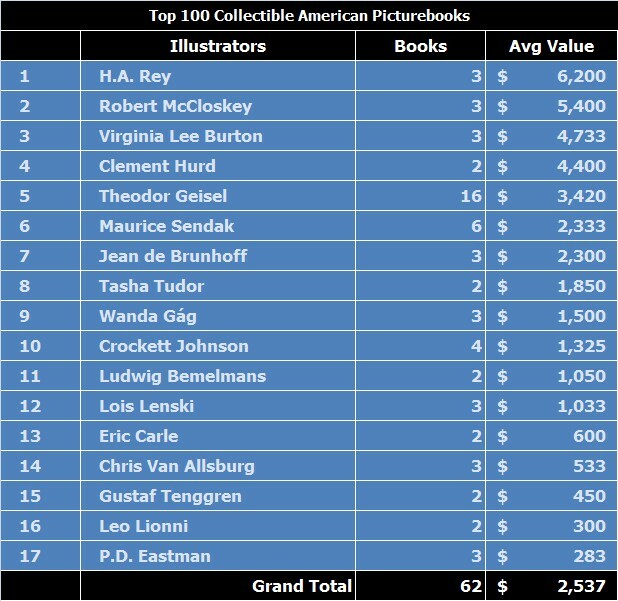 The next article in the series will rate the collectibility for each of the first edition books in Top 100 Collectible American Picturebooks.